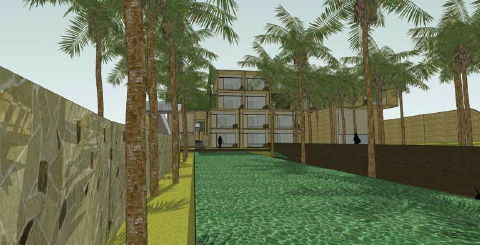 Urban sprawl is eating up Seminyak, Kerobokan and beyond. Years ago, in Legian they said, “We’ll never be like Kuta! So crowded! Such a mess!” Then in Seminyak, they said, “We’ll never be like Legian!” And in Petitenget they said, “We’ll never be like Seminyak!” But the advance of urbanization in South Bali seems unstoppable now. 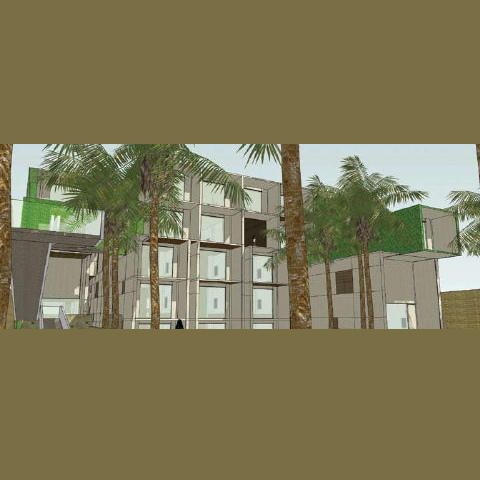 Here’s another apartment project in Petitenget, located on land beside the planned highway connecting Sunset Road in Seminyak to Tabanan Regency. 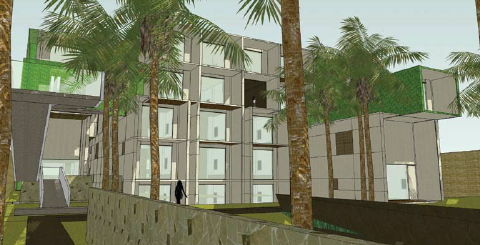 The five-story apartment complex is composed of a “playful” arrangement of boxes, grouped in compounds and set at the back of the 71 are lot, away from the highway. So, here we go, folks. Petitenget may soon resemble Jakarta. I thought the new governor of Bali was going to put a moratorium on all new developments. How come development is still proceeding at the same rate? Well, there was some discussion about that, but it never even came close to happening. Development is still accelerating. The government did manage to compose and agree on a general planning and zoning map for the island recently, which seems to me to be a step in the right direction, but not a solution to the problems and issues arising from hyper-fast and poorly-regulated development already under way. Anybody have an updated map? I believe some of the prominent property agents in Bali have maps indicating the likely route of the road. My understanding is it keeps changing, along certain stretches, while others are more or less concerned. I have seen surveyor's marks stenciled on stone markers on the road to Pantai Lima and parallel roads further west.